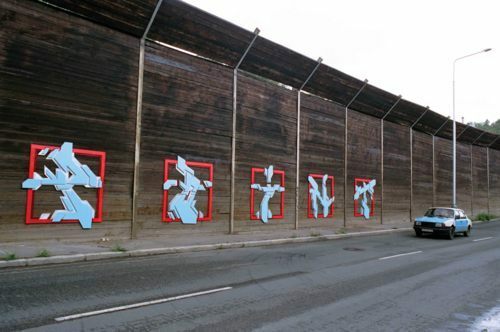 The last decade has seen a sea change in public attitudes towards graffiti and street art. Slowly, governments and major institutions are starting to see value in these art forms in prominent public spaces, which is a stylistic departure from the muted colours of more traditional community murals. The forward-thinking Czech Centre in London recently brought Point and Pasta Oner over to the UK to collaborate on the “Kupka Project,” alongside Bristol-born graffiti pioneer Inkie. The Kupka Project was inspired by a 1912 painting from Czech artist Frantisek Kupka on its 100 year anniversary. I caught up with Jan Kalab (Point, also known as Cakes), to find out more. After the Communist system fell in 1989 graffiti slowly started to appear on the streets of Prague. As soon as I saw it for first time I knew I had to do it. There were no graffiti magazines, no internet and I even didn’t know what to call the pictures on the walls! It was just so fresh! 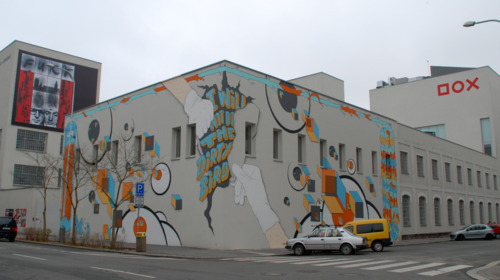 I had been drawing since I was a child and I began writing graffiti in 1993; I consider myself part of the second generation of Czech writers. I naturally developed over time; the more you do something more you understand it. Painting illegally is the best training. You have no time and you are under pressure, so you have to do it all automatically. 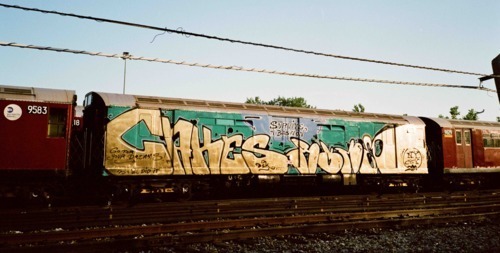 Until 2000 I painted a lot of trains and bombed the streets. From there I went into a more artistic direction (I studied at the Art Academy in Prague). Studying art at the academy gave me a lot because of the workshops. I got to work with wood and metal and you can even learn how to mold things. In the last few years however, I have focused on painting. In 2008 I began to paint on canvas, which changed my style a lot. Letters don’t work on canvas, so I had to find new language, which took years and a lot of effort. I played a lot with fragments of letters until the moment when the letters disappeared. Now my painting looks more like the abstract geometry from beginning of the last century than graffiti. Now it doesn’t matter if it’s a big mural or on canvas. I keep the name Cakes for my traditional graffiti pieces. I use the name Point more for 3D graffiti sculptures. I use my real name Jan Kalab with my fine art. It’s confusing but that’s how it is! I had with radio show with Pasta for a while; it was a funny experience but it was tough to prepare an hour each week. The show didn’t last long because of the topic I guess! We invited guests for interviews and graffiti writers of course. Talking on a public radio about illegal activities (i.e. graffiti) was probably too much, so the show closed down after some months. 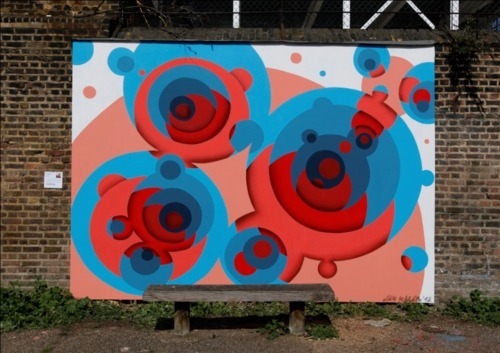 The Kupka Project is a series of three street art pieces celebrating the Olympics 2012 by Czech artists Point and Pasta Oner and UK artist Inkie will be displayed on the wall along the popular canal footpath leading to Stratford, the site of the London 2012 Olympic Park. The project is part of the Czech Open 2012. The Czech Centre in London asked if I would get involved in the Kupka project. Kupka’s work is very familiar to me. I liked his work even when I painted traditional graffiti. I think if he were alive in this century he would be painting graffiti. I like the abstract world of forms and relationship between forms.